Pay what you want and help charity. That’s the name of the game for the latest Humble Bundle that just released. What’s new this time is that instead of only PC/Mac/Linux related games, this time it is for the Android and PC/Mac/Linux. You choose how much you want to pay and how much you want to allocate between developer, charity and the organizers. If you beat the average, you also receive a bonus game (or more) all DRM free. As a note, previous Humble Bundles in the past have added bonus games after the fact, and for those who previously beat the average will also receive the bonus games retroactively. 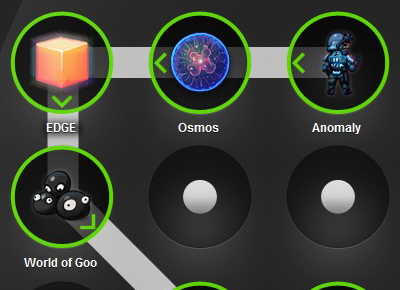 The following games are being offered right now: Anomaly: Warzone Earth, Osmos, and EDGE. If you pay more than the average price, you also get the indie classic World of Goo! This is for a limited amount of time and once again this all goes to a good cause! This entry was posted in Games, Mobile and tagged anomaly, charity, child's play, edge, EFF, humble bundle for android, linux, mac, osmos, pc, steam, warzone earth, world of goo on January 31, 2012 by David W.